KUDU. Written and directed by Lwanda Sindaphi with Beviol Swarts, Emmanuel Ntsamba, Livie Ncanywa, Luthando Mvandaba, Lwando Magwaca, Natasha Gana, Inge Isaacs and Zizipho Ouluba. Design: Asiphe Lili (assisted by Craig Leo). Music: Zinzi Nogavu. Choreography: Jennie Reznek. Baxter Theatre. 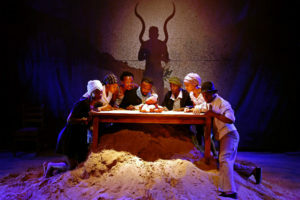 Lwande Sindaphi’s new play at the Baxter addresses an issue that is both age-old and contemporary – claiming of the land. Kudu is set in the future, but it could as well have taken place way back in the past, and its essential theme is a source of contention in current times. Along with actual land entitlement, Sindaphi additionally expands the notion of claiming to include culture, language and spirituality. The result is a searing statement on customs crushed, on traditions trampled, on people abandoned. Kudu is a brave blend of politics, mysticism, music and poetry. The script is distinctly lyrical – no surprise, taken Sindaphi’s award-winning career as a poet. While polished with a veneer of magic realism, the narrative is also not afraid to tackle the very gritty issues that lie underneath. And Sindaphi has a cast who rise to the occasion with passion and flair. 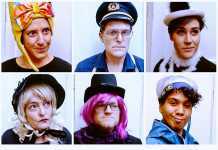 The ensemble cast of eight combine (multilingual) performances with beautiful singing and compelling movement. The simple but striking set and lighting, combined with symbolic props, all merge to form a cohesive – and at times contentious – flow. Kudu is part of the Baxter’s Platform for Special Talent, a programme designed to develop and provide a platform for talented theatre-makers to expose their work. Through mentorship and access to a professional theatrical space, they’re encouraged and supported to build viable careers in the performing arts environment. 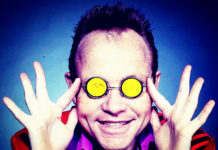 Sindaphi studied physical theatre and acting at Magnet Theatre, and it is a Magnet team who have contributed to this work, notably Jennie Reznek with choreography and Craig Leo with design. It is a much-welcome initiative, and if Kudu is a precedent, one that should reap rich rewards moving forward. If there were to be any quibbles about the production, it would be that there is a slight monotony to the tonal range – the dynamics could have been more pronounced, between soft and hard, loud and quiet, light and dark. And the initial movie clip is not really necessary – the play speaks eloquently for itself. 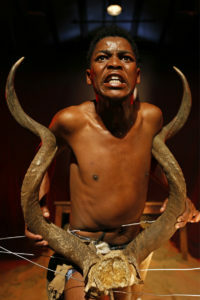 Kudu is a moving, aesthetically-satisfying and significant piece of work, one well worth going to see. And well congratulating, to all the team who made it happen.